When sixteen-year-old Christina Jacobs comes to school one day and discovers that life will never be the same again, she soon finds herself sinking away into self-doubt, haunted by her troubled thoughts and experiences and striving for acceptance and equality. 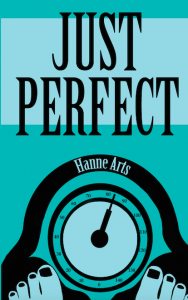 “Just Perfect” is a grippingly honest account of love and friendship, betrayal and trust, and inner demons and the fight for a better tomorrow. For over two years, I had been working and reworking “Just Perfect,” being first inspired to start writing it as a result of the difficult times I myself have gone through. Feeling the need to help others through the sharing of my personal struggles – experienced by so many others as well – I believed it would be incredible to share my work with the largest audience possible. And it is. Many of the characters are based off of people I have met in my life. In this way, I could create characters that truly come alive on the page. Although all fictional characters, their personalities and/or physical features are all from a mix of people I know. My mind raced. Maybe I was imagining it; maybe there was nothing going on at all and I was just making up scenarios in my head. I was driving myself insane. I’d always had a flowing imagination – what else could there possibly be?